Vegetarian and vegan aquaintances aside I do not know anyone who does not love a roast and they are a staple of my cooking repertoire. 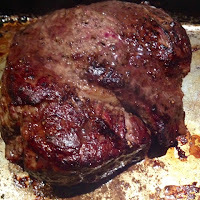 The roast is an easy meal to make and good for a crowd. It can be extended with plenty of vegetables, clever carving and the use of stuffing. Of course I have friends that do not eat beef or lamb or pork and always take this in to consideration when choosing the roast. 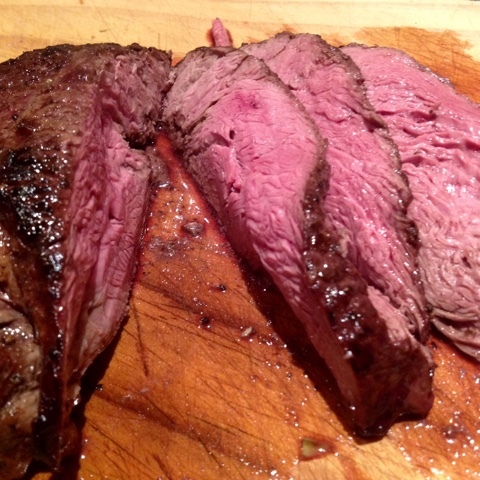 This is the perfect roast for the true red meat lover. Serve with roast chat potatoes and steamed greens. 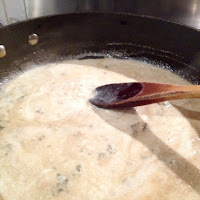 Other sauces or herb butters could be used if the cheese sauce is not something that you like. Rare roast beef or in this case eye fillet is a special roast and not something I make very often, never for those who like their meat well done and usually when I happen on eye fillet at a reduced price. Other cuts of beef such as scotch fillet and porterhouse can be used. This is such an easy dish to make, however, timing is important. The meat will go from just right to overcooked in no time. Heat a little oil in a frypan and brown meat all over. Place the browned meat on a tray and put into the hot oven. 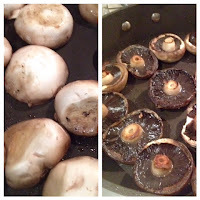 Cook the mushrooms in the same pan that was used to brown the beef. Quickly sear on both sides and then place in the oven with the beef. Make the sauce, simmer. Remove from heat and reheat just prior to serving. Strain if you like a smooth sauce. Rest the meat for 10 -15 minutes before carving. Cook aparagus while the meat is resting. If possible, remove meat from the fridge about thirty minutes before cooking. Lightly coat the meat with oil and then season with freshly ground black pepper. Heat a little oil in a frypan and brown meat all over. Place the browned meat on a tray and put into the hot oven. 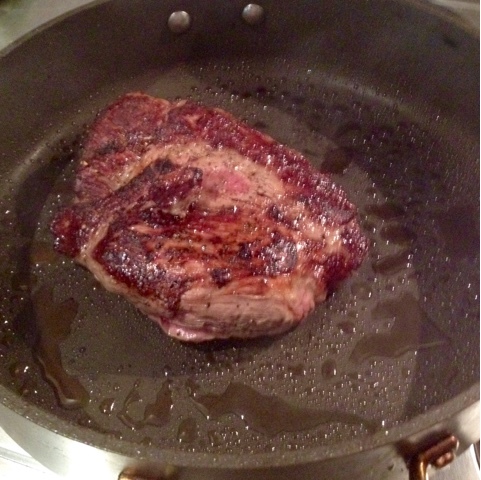 Cook the beef for 30 – 40 minutes depending on the thickness and weight of the meat*. As a guide cook the beef for 20 minutes per 500g. Cook a little longer if you prefer meat that is medium. Add roasting juices to blue cheese sauce. *I use a thermometer and remove from the oven when it reaches about 55 deg C. The meat will continue to cook during the resting period so it is best to under cook the meat. Cook the mushrooms in the same pan that was used to brown the beef. Quickly sear the mushrooms on both sides and then place in the oven with the beef. Place the sherry, garlic and peppercorns in the pan used to brown the meat and mushrooms. Bring to the boil and then simmer until liquid has reduced by half. Remove peppercorns. Cut cheese into small pieces and add to the sherry. Melt over low heat and stir. Trim asparagus and cook in boiling water until just cooked. Thin, young spears will take about two – three minutes, slightly longer for thicker spears. Place three mushrooms on each plate. 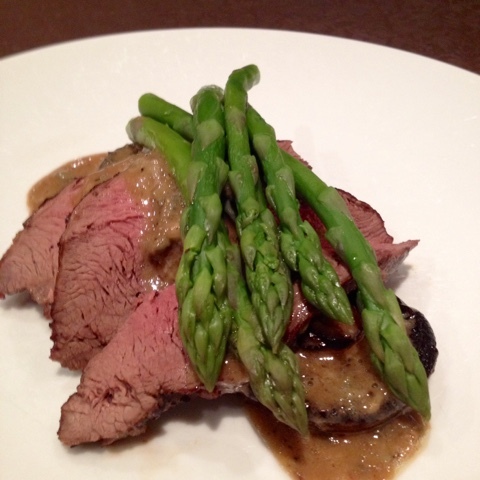 Top with thinly sliced beef, spoon over a little sauce and then place the asparagus spears on top of the meat.